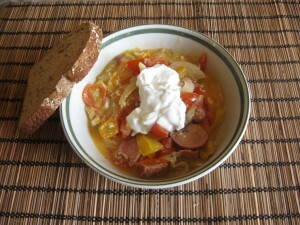 This recipe was written especially for website Slovakcooking, which includes many recipes about Slovak Cooking and traditions. Check it out HERE. I love my mom’s Slovak Leco. It tastes great, and best of all, is very easy to make. 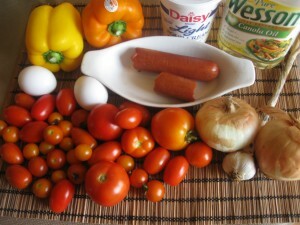 We will focus today on using fresh food, which is full of vitamins. 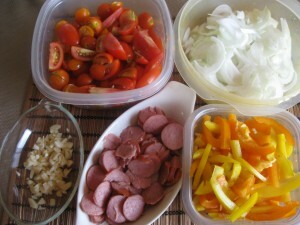 Cut up all ingredients based on the pictures below. 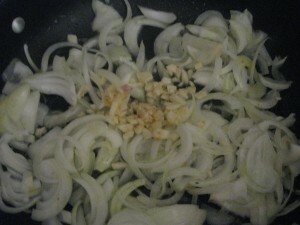 In pan, saute the onion and after 7 min add minced garlic, sausage and peppers. Cook cca 10 min and add tomatoes. 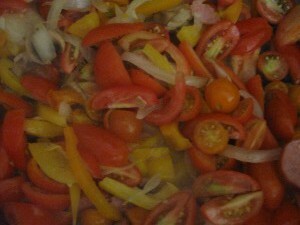 Cook until tomatoes are soft (I like them a little crunchy and not cooked all the way through). Taste for seasoning as the amount of salt depends on the saltiness of your meat. Use salt and vegeta to taste. Then add 2 mixed eggs and cook an additional 5 min. Now you are done! 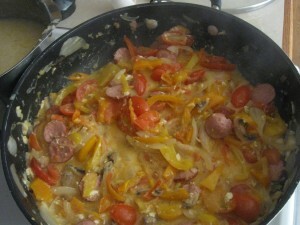 For recipe in Slovak click HERE. You can find more Slovakmama recipe HERE. Thank you for visiting my site and I hope to hear from you soon.